BACKGROUND AND PURPOSE: To evaluate the ready-to-use iodine-containing polyvinyl alcohol (I-PVA) dissolved in the low angiotoxic solvent N-methyl pyrrolidone (NMP) for embolization of porcine wide-necked aneurysms. METHODS: Fourteen broad-based carotid sidewall aneurysms were surgically constructed in 7 swine. I-PVA (40%) in NMP was injected under temporary balloon occlusion bridging the aneurysm neck. After 4 weeks, follow-up angiography, multisection CT angiography (MSCTA), and 3T MR imaging including MR angiography (MRA) sequences were performed. Afterward, harvested aneurysms were investigated histopathologically. RESULTS: The liquid embolic was well visible under fluoroscopy and displayed a favorable precipitation pattern, allowing for controlled polymer delivery. Ten aneurysms (71%) were initially completely occluded, whereas in 1 aneurysm, a minimal polymer leakage was observed. The other 4 aneurysms (29%) were almost completely occluded. One animal suffered a lethal rebleeding from the anastomosis after uneventful embolization. Aneurysms embolized with I-PVA could be discriminated well from the parent artery without beam-hardening artifacts on MSCTA, and no susceptibility artifacts were encountered on MR imaging. Histologic examination revealed all aneurysms covered with a membrane of fibroblasts and an endothelial cell layer while a moderate intraaneurysmal inflammatory response to the polymer was observed. CONCLUSION: I-PVA dissolved in NMP has proved its effectiveness for the embolization of experimental wide-necked aneurysms. This precipitating liquid embolic offers several interesting features in that it needs no preparation before use and no radiopaque admixtures, the latter allowing for artifact-free evaluation of treated aneurysms with MSCTA and MRA. Moreover, it uses NMP as a solvent, which has only a low angiotoxicity. N-Methyl pyrrolidone (NMP) is a water-miscible organic solvent with a low systemic toxicity, thus progressively replacing more toxic and highly volatile solvents. Most importantly, for use as a component of liquid embolics, NMP evokes little or no vasospasm after superselective injections in the artery of the rete in swine, suggesting a far better angiotoxic profile compared with DMSO (see Dudeck et al, p. 1900–06). Furthermore, NMP has a better hemocompatible profile compared with the strong hemolytic DMSO.26 A drug-delivery system that can be used for human parenteral, subcutaneous, or intramuscular drug delivery based on a polymeric matrix formulation dissolved in NMP has been approved by the US Food & Drug Administration (Atrigel Implant Drug Delivery Technology; Atrix Laboratories, Fort Collins, Colo). The carrier solvent as an integral component of nonadhesive liquid embolics has decisive influence on the precipitation characteristics of the polymer. Thus, the aim of this experimental investigation was to evaluate an iodine-containing polyvinyl alcohol (I-PVA) dissolved in the low angiotoxic organic solvent NMP for its suitability as a liquid embolic, which would eliminate several shortcomings of Onyx. The liquid embolic agent used was a 40% (polymer weight/solvent weight) solution of an I-PVA in NMP. It can be stored and used at room temperature. To ensure good radiopacity, the polymer was grafted with iodinated groups, which resulted in a high iodine content (44% [w/w]). The viscosity of the solution at room temperature was 380 mPa · s. When this mixture contacts aqueous media, such as blood, the solvent rapidly diffuses away, causing immediate surface precipitation and solidification of the polymer with formation of a solid embolus at the targeted site. Before in vivo evaluation, several mixtures of I-PVA (30%–45%) in NMP were tested in vitro to select the best formulation to be used in the animal laboratory. Special attention was paid to viscosity and solidification time. Solidification time was determined by injection of I-PVA solution via a microcatheter (MicroFerret; Cook Europe, Bjaeverskov, Denmark) into saline at 37°C. All animal experiments were performed after permission had been obtained from the Animal Experimentation Ethical Committee and according to the Animal Care Guidelines of the Committee. Seven female swine were used in the study. The animals were 2 to 3 months old, weighed 25 to 30 kg, and were maintained on a standard laboratory diet. After overnight fast, each swine was premedicated with intramuscular ketamine (20 mg/kg). After endotracheal intubation, general anesthesia was maintained with mechanical ventilation and inhalation of 0.5%–1.5% halothane. The embolization procedures as well as the follow-up angiograms were carried out under intravenous general anesthesia with fentanyl (0.025 mg/kg/h) and ketamine (20 mg/kg/h). Pancuronium (0.1 mg/kg/h) was given for muscle relaxation. A total of 14 wide-necked sidewall aneurysms of the common carotid artery (CCA) were created bilaterally in 7 swine. This technique of aneurysm construction has been reported previously.27 In short, the right external jugular vein was isolated and divided into 2 equal segments to make 2 aneurysms of equal size. An arteriotomy was performed to ensure a wide orifice of the aneurysm. An end-to-side anastomosis was made, and the distal ends of the venous pouches were sewn closed by using 7–0 Prolene. Heparin (5000 IU) was given at the beginning of this procedure. The mean aneurysmal-sac diameter was 9.2 ± 2.1 mm, the mean neck diameter was 6.6 ± 1.3 mm with a mean sac-to-neck-ratio of 0.73 ± 0.09. All endovascular treatments of aneurysms were performed immediately after their construction using angiography unit Integris V (Philips Medical Systems, Best, The Netherlands). Endovascular procedures started with sonographically guided placement of 5F and 6F sheaths in the left and right femoral arteries, which were attached to pressurized saline infusions. Then 5000 IU of heparin was given. Four French (Vertebral, Terumo Europe, Leuven, Belgium) and 6F guiding catheters (Envoy; Cordis, Miami Lakes, Fla) were placed in the CCA harboring the aneurysm, through which a microcatheter (Rebar 14; Micro Therapeutics, Irvine, Calif) was positioned in the deepest part of the aneurysmal sac, and a microballoon catheter (HyperGlide; Micro Therapeutics) was advanced to bridge the neck of the aneurysm. Before embolization, an aneurysmogram was performed with an inflated microballoon to ensure intra-aneurysmal blood flow-arrest. The dead space of the microcatheter was filled with NMP, the balloon was inflated again, and the liquid embolic agent was injected using a specifically designed Cadence Precision Injector syringe (Micro Therapeutics), which operates by a screw thread. The mean amount of I-PVA solution injected was 0.26 ± 0.07 mL (range, 0.15 to 0.4 mL). Injections of I-PVA solution were performed in strict analogy to the recommended clinical application of Onyx, so that the polymer was injected only within the first 2 minutes of a temporary occlusion interval of, in total, 5 minutes (injection speed was not to exceed 0.1 mL/min). During embolization, the animals were monitored with ECG to detect systemic effects (eg, arrhythmia) (Sirecust 732; Siemens, Erlangen, Germany). Furthermore, blood was drawn before and after embolization to evaluate hemolytic parameters (hemoglobin [Hb], free hemoglobin [fHb], and lactate dehydrogenase [LDH]). The next embolization cycle was performed after a cerebral reperfusion time of 5 minutes. This procedure was repeated until the aneurysm was filled with polymer. The mean number of embolization cycles was 4.1 ± 1.4. Microcatheter withdrawal was performed under 80% balloon inflation 10 minutes after the last embolization. For the following 4 weeks, 300 mg of aspirin (Bayer, Leverkusen, Germany) and 37.5 mg of clopidogrel (Plavix) per day were administered orally. After this time, multisection CT angiography (MSCTA), high-field MR imaging at 3T, and follow-up angiography were performed. Parameters for MSCTA (Light Speed 16; General Electric, Milwaukee, Wis) were: collimation, 16 × 1.25 mm; section thickness, 0.625 mm; rotation time, 0.8 seconds; voltage, 120 kV; and beam current, 380 mA. Sequences used for MR imaging included T1-weighted 3D fast-spoiled gradient-echo (FSPGR; repetition time [TR], 6.5 ms; echo time [TE], 1.5 ms; field of view [FOV], 22 × 16.5 mm; 1-mm section thickness, matrix, 256 × 192), 2D gradient-echo (TR, 300 ms; TE, 5.1 ms; FOV, 20 × 20 mm; 3-mm section thickness; matrix, 256 × 160), T2-weighted fast spin-echo (TR, 3500 ms; TE, 98 ms; FOV, 24 × 24 mm; 3-mm section thickness; matrix, 512 × 256), and 3D time-of-flight MR angiography (MRA) gradient-echo sequences (TR, 30 ms; TE, 4.3 ms; FOV, 24 × 18 mm; 1-mm section thickness; matrix, 512 × 256) as well as gadolinium-enhanced T1-weighted 3D FSPGR and 2D gradient-echo sequences. Follow-up angiograms (Vertebral; Terumo Europe, Leuven, Belgium) were obtained under intravenous general anesthesia as described above. After follow-up angiography, swine were sacrificed while under general anesthesia using standard approved procedures. For macroscopic analysis of liquid embolic distribution and aneurysm neck morphology, both carotid arteries were opened along their vertical axis for inspection of the former aneurysm orifice. Standard techniques were used for the preparation of aneurysm sections. Cross-sections of 5-μm thickness were obtained through the neck of each aneurysm, stained with hematoxylin-eosin (H&E), and Elastica van Gieson (EvG) and Ladewig’s trichrome stains for microscopic examination. Intra-aneurysmal liquid embolic distribution, angionecrosis, the extent of inflammation inside the aneurysm, the presence of an accompanying foreign-body reaction, connective tissue formation, and the presence of a newly developed membrane at the former aneurysm orifice were evaluated. An independent neuropathologist at an outside institute recorded histologic findings. When injected into saline, a 40% mixture of I-PVA in NMP displayed the best in vitro precipitation characteristics within the range of mixtures tested (30%–45%). The polymer solution was viscous but still easily injectable through the microcatheter and solidified immediately after emerging from the catheter tip to form a solid mass (data not shown). 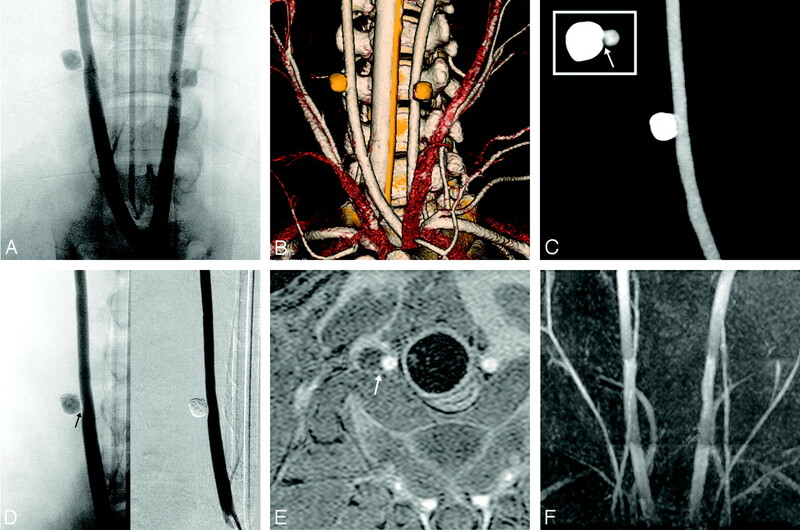 Embolization of Experimental Wide-Necked Aneurysms. I-PVA solubilized in NMP can be stored and used at room temperature without heating, shaking, or any other prior preparation step. All embolizations (n = 14) were feasible, and no technical problems directly related to liquid embolic injections were encountered (eg, no embolic wash-out of not readily solidified polymer or gluing to any catheters used), and the microcatheter was always easily removable from the embolized aneurysm. Primary complete occlusion was attained in 71% (n = 10) and almost complete occlusion (90%–95%) in 29% (n = 4), resulting in a mean embolization rate of 98% (Fig 1). The most incomplete embolization occurred in a case presenting with a small dissection at the vascular anastomosis during the intervention. Here, further embolization was aborted at an occlusion rate of 90% (swine 1, right side). A, Digital subtraction carotid artery angiogram (DSA) of experimental aneurysm (swine 6, right common carotid artery). B, Aneurysmography performed before embolization confirms blood flow-arrest while a compliant balloon bridging the aneurysm neck is inflated (arrow indicates tip of the microcatheter within the aneurysm cavity). C, First cycle of polymer injection. I-PVA is injected within the first 2 minutes of a temporary carotid artery occlusion time of 5 minutes total. Note the good visibility of I-PVA, which accumulates at the tip of the microcatheter, under fluoroscopy. D, Second cycle of polymer injection. I-PVA enlarges mainly around the microcatheter, gradually filling the aneurysm cavity. E, Third cycle of polymer injection after which I-PVA appears to completely fill the aneurysm. F, Immediate postembolization DSA demonstrates almost complete occlusion of the aneurysm with a small neck remnant next to the former microcatheter position (arrow). Injection of the I-PVA solution could be performed very precisely because of the very good radiopacity under fluoroscopy and a favorable precipitation pattern of the liquid embolic. Thus, further addition of a radiopaque agent was not needed as the iodine-containing polymer provided for sufficient radiopacity by itself (Fig 1, C–E). Furthermore, I-PVA frequently precipitated at the tip of the microcatheter during the first embolization cycle (Fig 1C) allowing for a controlled enlargement of this mass during the following cycles and gradual filling of the aneurysm cavity (Fig 1, D–E). Only in 1 case of an aneurysm (which was completely occluded), a small leakage of I-PVA into the carotid artery lumen was observed, which did not lead to significant vessel stenosis (swine 2, left side). In addition, follow-up angiography ruled out late carotid artery occlusion. All animals except 1 tolerated the surgical and endovascular procedures well. This pig (swine 3) suffered a lethal rebleeding under anticoagulation from 1 vascular anastomosis after uneventful embolization. Hemodynamic and Laboratory Blood Value Evaluation. In none of the animals were significant changes in heart rate or ECG (eg, arrythmias or ectopias) observed during embolization, which would have indicated an acute toxic reaction attributable to the solvent NMP. Serum Hb, fHb, and LDH indicating hemolysis were determined before and after embolization. Mean values were 8.6 ± 1.0 g/dL before and 8.3 ± 1.2 g/dL after embolization for Hb, 18.0 ± 17.5 mg/dL before and 15.8 ± 12.3 mg/dL after embolization for fHb, and 531.8 ± 65.6 U/L before and 487.6 ± 44.4 U/L after embolization for LDH, respectively. These values were of no statistical significance (Wilcoxon test: P = .343 [Hb]; P = .344 [fHb] and P = .225 [LDH], respectively), thus no signs of hemolysis were found. Four-week follow-up angiography revealed persistent complete casting of the embolized aneurysms and all aneurysms were completely occluded at that time (Fig 2A). In all cases, patency of the carotid artery was preserved, thus no late parent artery occlusion was noted. On MSCTA performed before follow-up angiography, no beam-hardening artifacts were produced by aneurysms that were embolized with I-PVA. The polymer-filled aneurysms displayed HU between 2500 and 3000. Therefore, the aneurysms could be discriminated well from the adjacent carotid artery allowing for a precise and detailed analysis of the embolized aneurysms in axial images and 3D reconstructions with high spatial resolution (Fig 2B). Closer vessel inspection based on postprocessed images displaying exclusively the aneurysm frequently revealed a remarkable separation between the cast and the carotid artery, suggesting the formation of a neointimal layer (Fig 2C, arrow). Nevertheless, this finding was best demonstrated by unsubtracted angiography (Fig 2D, arrow). At MR imaging, I-PVA appeared hypointense on T1-weighted and hyperintense on T2-weighted images (Fig 2E). Furthermore, MRA demonstrated preserved carotid artery patency, and no flow turbulences were observed at the former aneurysm orifice (Fig 2F). In general, at MR imaging no relevant susceptibility artifacts related to the polymer were encountered. Follow-up investigations after 4 weeks. A, Bicarotid trunk angiogram obtained 4 weeks after embolization reveals bilateral complete aneurysm occlusion with preserved parent artery patency. B, Volume-rendered reconstruction of 16-row multisection CT angiogram (MSCTA). The polymer-filled aneurysms do not produce beam-hardening artifacts, so that morphology of the parent artery and that of the polymer cast could be evaluated concomitantly, frequently confirming angiographic findings. C, Maximum intensity projection (MIP) of MSCTA displaying exclusively the right carotid artery for closer vessel evaluation. Note the separation between the cast and the carotid artery on axial sections suggesting the formation of a neointima layer (arrow, upper left hand corner). D, Right carotid artery angiogram confirms MSCTA findings, but demonstrates this soft tissue interposition more clearly (arrow). E, Axial gadolinium-enhanced T1-weighted 3D fast-spoiled gradient-echo imaging (FSPGR) allows for a detailed evaluation of the configuration of the polymer cast, demonstrating a smooth reconstruction of the arterial vessel wall (arrow). F, 3D time-of-flight MR angiography shows preserved carotid artery patency; no intra-aneurysmal flow signals were observed. Macroscopic investigation of the resected aneurysms and carotid arteries excluded arterial thrombosis and carotid artery occlusion in all cases. Furthermore, the former aneurysm neck was always completely covered with a connective tissue layer (Fig 3A). Microscopic analysis at a low magnification revealed a smooth transition from the surface of the carotid artery to the newly formed membrane, which consisted mainly of fibrous connective tissue (Fig 3B, arrows). No inflammatory response was observed within the carotid artery wall and no signs of angionecrosis or fibrin deposition in the carotid artery or aneurysm wall were found—except for the areas next to the suture material (Fig 3B). Histologic examination of the former aneurysm neck revealed that the membrane was frequently covered by an endothelial monolayer resembling a neointima, but without evidence of an internal elastic lamina (Fig 3C). The appearance of the polymer within the aneurysm cavity was rather spongy, and polymer fragments were encased by a mostly moderate tissue response consisting of lymphocytes, histiocytes, macrophages, and numerous multinucleated foreign body giant cells, which was always limited to the aneurysm cavity (Fig 3D). A, Macroscopic view of the aneurysm orifice from the arterial lumen. The former aneurysm neck is completely covered with a fibrous tissue layer. B, Microscopic view of the carotid artery harboring the embolized aneurysm reveals a smooth transition from the arterial wall surface to the newly formed membrane (arrows), which consists of fibrous connective tissue (hematoxylin-eosin; original magnification, 20×). C, carotid artery wall; M, connective tissue membrane; S, suture; P, polymer inclusions. C, Neointima formation consisting of fibroblasts covered by a single layer of endothelial cells (arrows). Note the disruption of the internal elastic lamina within the neointima (Elastica van Gieson; original magnification, 100×). C, carotid artery wall; M, connective tissue membrane. D, Intra-aneurysmal inflammatory response consists mostly of lymphocytes and histiocytes (IR). Note numerous multinucleated foreign giant cells (GC) surrounding the eosinophilic embolic material (P) as well as many inflammatory cells within the polymer fragments (hematoxylin-eosin; original magnification, 100×). A summary of immediate and follow-up angiographic and histopathologic results is shown in the Table. The quest for the best endovascular obliteration of wide-necked aneurysms is ongoing. The major advantage of using liquid embolics for the treatment of these aneurysms is the ability of an embolic agent to conform well to the irregular shape of an aneurysm cavity, regardless of its configuration, yielding complete filling of the aneurysm in the ideal case. Indeed, the use of Onyx for the obliteration of difficult aneurysms resulted in superior occlusion rates compared with GDC embolization, whereas treatment morbidity was comparably low.10 However, this liquid embolic has several shortcomings, as mentioned above. I-PVA dissolved in the low angiotoxic solvent NMP is a nonadhesive, iodine-containing liquid embolic featuring several advantageous properties for a simpler and safer embolization with biocompatible components. This honey-like, ready-to use solution needs no prior preparation because the covalently bound iodine accounts for homogeneous and well- contrasted radiopacity without further admixtures. The liquid embolic displayed favorable precipitation dynamics. 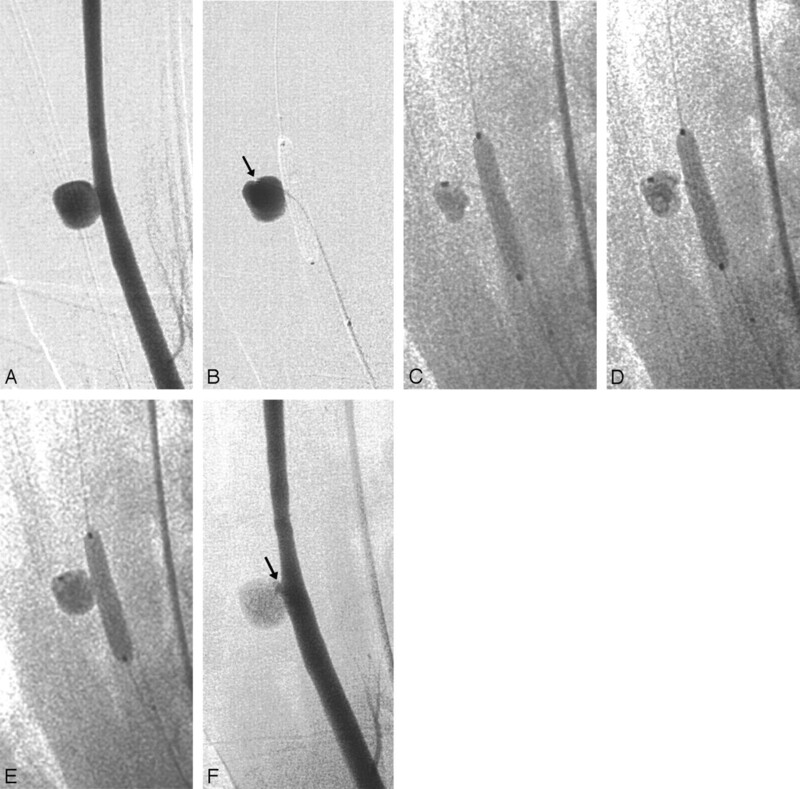 The injected polymer frequently accumulated at the tip of the microcatheter in the first embolization cycle, making it possible to perform a very controlled enlargement of this embolus by further polymer injections (compare Fig 1, C–E). Without doubt, the intense fluoroscopic contrast of I-PVA was a major prerequisite for this very controlled intraaneurysmal polymer delivery, which resulted in a very high primary embolization rate of 98% with no technical problems related to the polymer injections. With regard to DMSO as the carrier solvent for liquid embolics, considerable concerns about general and especially local toxicities exist. Several studies have demonstrated severe vascular toxicities induced by DMSO.21,23,24,28 Rapid injections of DMSO delivered into the rete of swine caused significant immediate severe and long-lasting vasospasm, and subarachnoid hemorrhage, stroke, and death were frequent clinical sequelae.21 Although further examinations have revealed the angiotoxic effects of DMSO to be dose-dependent, even slow injections are still not devoid of vasospasm, which may even be severe in individual cases.23,29 In contrast, NMP has been shown to evoke no or only minimal vasospasm when injected into the artery of the rete (Dudeck et al, p. 1900–06). This odorless solvent has a low systemic toxicity in experimental animals, with an LD50 of 2.6–7.0 g/kg body weight.30 Therefore, changes in heart rate or ECG as signs of acute solvent toxicity would have been highly unlikely and were not observed in this and previous studies (Dudeck et al, p. 1900–06). DMSO has a remarkably high hemolytic activity, and anemia, sulfhemoglobinemia, hemoglobinuria, and bilirubinuria have been reported in humans after dermal and intravenous applications.15,31 Therefore, solvents like NMP, which show a lower hemolytic activity than DMSO, should be preferred as components of precipitating liquid embolics.26 In this study, no significant changes of hemolytic parameters attributable to NMP were registered. Furthermore, no signs of histotoxicity attributable to either the polymer or the solvent were observed in any of the specimens investigated. The liquid embolic caused only a physiologic tissue response characterized by tissue organization and a mostly moderate inflammation, which was always limited to the aneurysm cavity. Interestingly, this tissue response was obviously capable of degrading some of the polymer, so that histologic examination after 4 weeks frequently showed polymer fragments surrounded by foreign body giant cells and inflammatory cells within the embolic mass (Fig 3D). Nevertheless, the concern that this physiologic repair mechanism might result in recanalization is most likely arbitrary, in that such a limited and very slow degradation would go along with a replacement of degraded polymer by connective tissue, but additional experimental investigations with longer follow-up intervals would be necessary to fully clarify this issue. Conventional angiography is still the standard criterion for the evaluation of intracranial aneurysms. However, with ongoing technical evolution, the role of noninvasive techniques such as CTA, MR imaging, and MRA for screening, detection, and follow-up of aneurysms have gradually emerged.32–36 MRA has evolved to the noninvasive follow-up technique of choice as beam-hardening artifacts severely compromise CT scans obtained in the presence of aneurysm clips, GDCs, and Onyx as well.12,37 I-PVA provided for good fluoroscopic radiopacity without metallic admixtures despite being less radiopaque than Onyx, so that no significant artifacts were encountered at CT and MR imaging. Multisection CT acquisition of single images with submillimeter section thickness allowed for detailed 3D reconstructions with high spatial resolution, on which the morphology of the parent artery and that of the polymer cast could well be evaluated concomitantly (Fig 2B, -C). At MR imaging, the polymer-filled aneurysms appeared hypointense in T1-weighted images and hyperintense in T2-weighted images (Fig 2E), which may be explained by the spongy appearance of the material in histologic sections. Furthermore, no flow artifacts were encountered at MRA (Fig 2F). Thus, aneurysms embolized with I-PVA can be followed by both noninvasive modalities, MSCTA and MRA. One major limitation regarding the use of liquid embolics for the occlusion of cerebral aneurysms is the poor control once the liquid embolic reaches the neck of the aneurysm. As it is most important to accomplish a complete filling of the aneurysm cavity to prevent recurrence, the effort to achieve this goal is associated with a considerable risk of polymer leakage into the parent artery. Therefore, the use of a protective balloon placed across the neck of the aneurysm is mandatory to reduce this risk. Nevertheless, even a very compliant balloon such as the HyperGlide (Micro Therapeutics) used in this experimental study can only achieve a flow-arrest in the aneurysm cavity, because the microcatheter placed inside the aneurysm prevents the aneurysm from being completely sealed off. This circumstance, together with the toothpaste effect, whereby the liquid embolic does not immediately cease to exit the microcatheter after the investigator stops turning the syringe, resulted in a small polymer leakage along the outside of the microcatheter into the parent artery during 1 embolization (swine 2, left side, compare Table). Nevertheless, the amount of polymer was so small that no carotid artery occlusion occurred either immediately after embolization or within the 4 week follow-up period. In addition, with growing experience in the use of this embolic device, no such incident occurred again. Embolization of experimental porcine wide-necked aneurysms with I-PVA dissolved in NMP was feasible and highly effective. This polymer-solvent mixture was ready to use without prior heating or shaking. It provided for adequate fluoroscopic visibility without radiopaque admixtures. Its favorable precipitation dynamics allowed for a very controlled intra-aneurysmal polymer delivery, which resulted in a high initial occlusion rate of 98%, and no technical difficulties were encountered. Very importantly, this liquid embolic uses NMP as a solvent with a far more favorable angiotoxic profile compared with DMSO, reducing the risk for solvent-related vessel injury and hemorrhage. Furthermore, treated aneurysms can be followed by both noninvasive modalities—MSCTA and MRA—without any artifacts. Thus, liquid I-PVA dissolved in NMP resembles a very promising neuroendovascular agent for the treatment of selected aneurysms. We thank Sanofi Synthelabo for the generous gift of clopidogrel (Plavix). Accepted after revision April 28, 2005.